Summer Fest is back again and stone fruits are the theme. To participate, read more about Summer Fest onAway To Garden from Margaret then come join the community! Catch up on this seasons previous themes on the bounty of Cukes N Zukes , Sweet Corn and Herbs, Beans, Greens. We love pluots (that delectable plum/apricot cross). 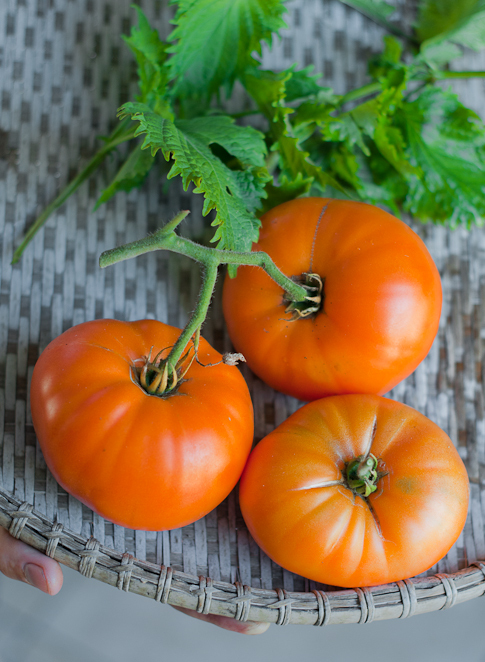 They are a wonderful creation of the Zaiger family which has inundated Farmers’ Markets, fine grocers and backyards everywhere. Flavor Grenades, Dapple Dandys (aka Dinosaur Eggs), Flavor Kings and Queens. They have the light tartness of a plum, the firmness of a great plum, but the mellowed sweetness of flesh more reminiscent of an apricot. Rarely do the pluots we buy (gardening side-note: we are growing Dapple Dandies but they’ve yet to produce. Hopefully next year as the tree has settled in and has grown quite nicely this summer) make it past the grab and eat junction, but occasionally we get to make a summer-perfect dessert with them. The poaching gently softens the pluots, plus slightly sweetening them with the complimenting flavors of agave nectar (honey, sugar, or palm sugar are all doable substitutes). Then the caramel sauce is made from some of the reserved poaching liquid, tying its flavor to the poached pluots. Finally a dollop of freshly made whipped cream adds a cool, creamy counterpoint to the pluots. If you’ve yet to experience a pluot, run to your nearest Farmer’s Market or exceptional grocer and try them. They are gems alongside their other wonderful brethren in the stone fruit family. 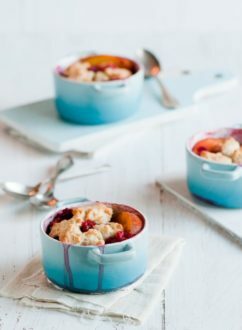 If fresh, chin dripping pluots are old hat to you, maybe have a little fun and try this recipe to finish off that warm summer night’s meal. Adjust the sweetener of poaching liquid to the the sweetness or tartness of your pluots or plums. Agave nectar gives a perfect flavor compliment to the pluots and riesling but sometimes is hard to find. Feel free to substitute honey or sugar to sweeten the poaching liquid. Poach pluots: Combine wine, sweetener (agave nectar, honey, or sugar), orange zest, and thyme in a saucepan and bring to a simmer. Add pluots in a single layer (poach in batches according to how many your saucepan can hold) and poach until your desired softness (usually about 5-10 min.) Set aside to cool. Strain & reserve poaching liquid. Make caramel sauce: Add 1/2 cup of reserved poaching liquid and 1 cup of sugar to a saucepan. Bring to a simmer and cook until it just starts to smoke and develops that perfect caramel scent (normally you can tell by the color but the poaching liquid darkens the sauce & your nose is your best judge of doneness.) Add another 1/2 cup of reserved poaching liquid to the caramel to thin it out (be very careful! It will hiss and piss and is a bit volatile. Hardly any burn is worse than a caramel burn!) Stir to combine. Strain any sugar chunks out of sauce & reserve. Make whipped cream: Combine heavy cream, confectioners' sugar, and vanilla extract in a bowl and whip to soft peaks. Cover and refrigerate until ready to serve pluots. 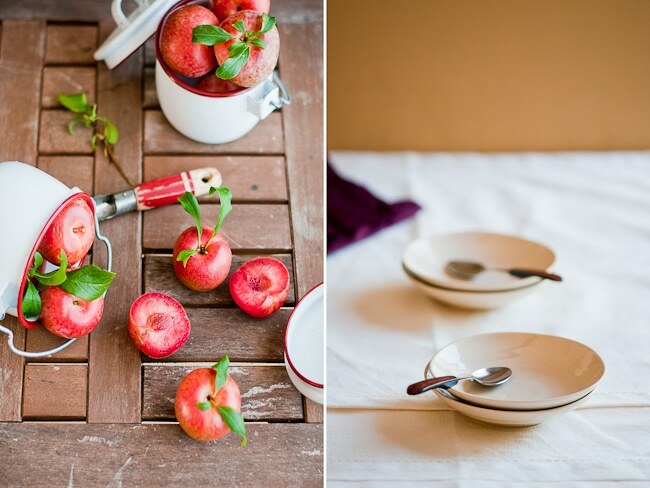 To serve, plate a couple pluots per serving on small plates. 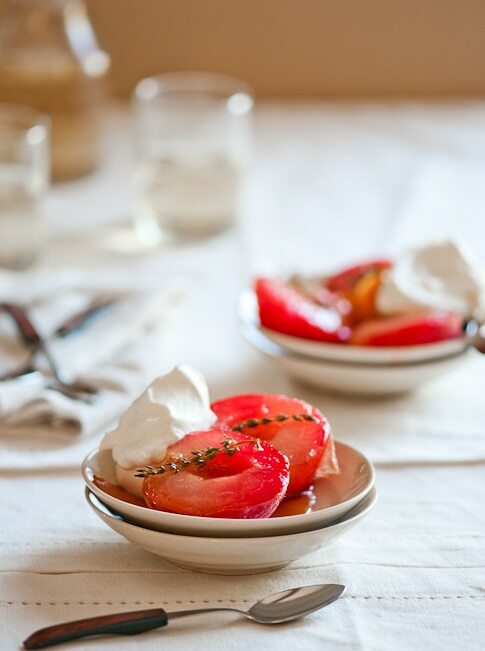 Pour caramel sauce over pluots and top with a nice dollop of whipped cream. 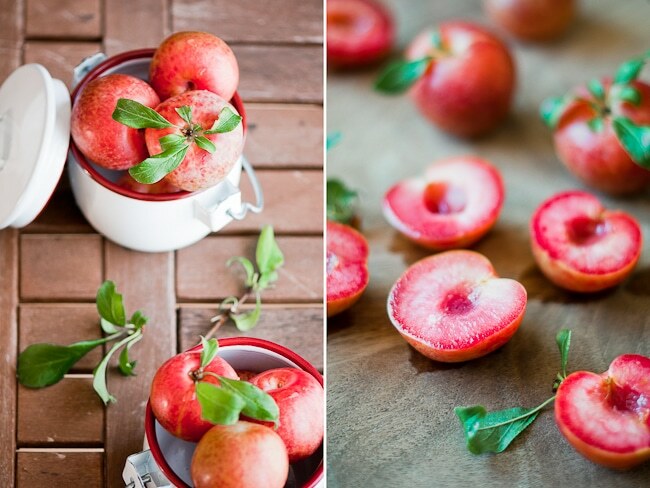 Oh my, the color of peaches is so lovely. I love fruit and wine: delicious, elegant, no hassle. I’ve never had a pluot, but I have seen them at the store. 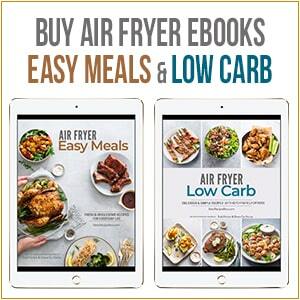 Thank goodness the weekend is here so I can try all these new recipes! I love Summer Fest! Simplictity is best. Always packed full of flavour. Beautiful photos…. Nature is so beautiful – and tasty! What a fabulous post you have! 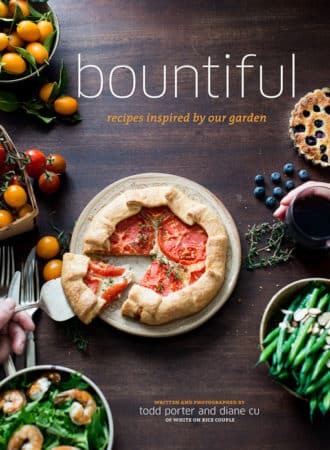 The pictures and recipe really inspire me to find a simple fruit or vegetable and turn it into a beautiful, simple dish. Gorgeous pictures, as always! Also, thanks for introducing me to pluots! These are so beautiful! 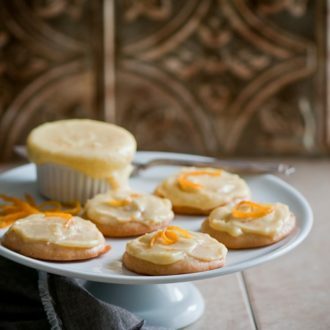 Lovely idea for a simple dessert in summer…just gorgeous. My market had a lovely basket of these out yesterday and I was wondering what to do with them. Your photograph is inspiring. Thank you. I have never tasted Market fresh pluots before – the fruit bought at the supermarket just did not do anything for me. I expect perfection from my stone fruit, that delectable balance between too firm and mushy, too bland and overripe, caught in a short moment of just right (I chase that perfection every summer with all my stone fruit, being raised in an environment where eating the fruit off the tree at the perfect moment was en everyday occurrence). 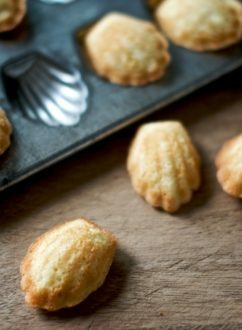 The combination of flavors in your recipe makes me try this with plums (but I will keep on searching for the perfect pluots! ), which are very accessible right now. And I just happen to have a bottle of Funf Riesling in the fridge! My site was down for two whole days, and I could not post on time, but my submission for this week’s Summer Fest is Damson Plum Jam Spiced with Rum. Wow. I love how juicy they look. And simple. And perfect. Adding this to my list of desserts for the next few weeks. Thanks for the inspiration! Anyway here is my gluten free plum clafouti for summer fest! This looks sooo good, and I was just wondering the other day what one does with a pluto. The pictures on this blog are always so breathtaking. I’ve never had a pluot before but I’m sold. I made a mint fruit salad with mine…. 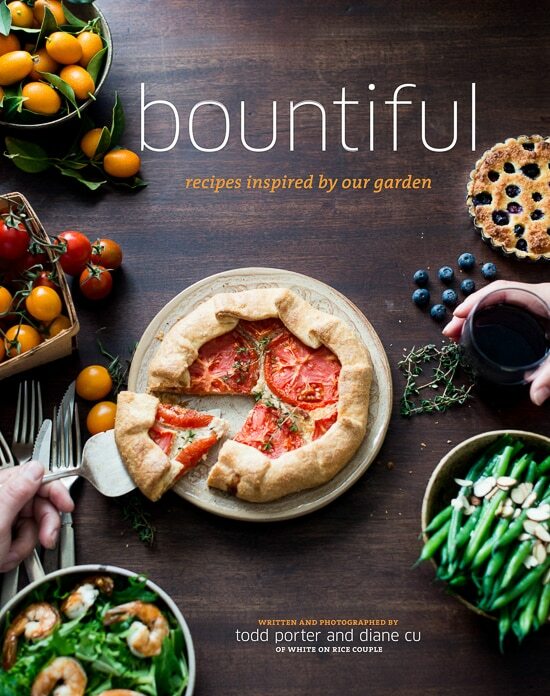 Beautiful pictures and delicious recipes, as always. Your blog is one of my favorite websites to read! Thank you!!!! Oh, now I simply must eat more pluots! Here is my contribution: Peach Crisp for Summer Fest 2010. It’s lovely served hot out of the oven with a cold scoop of vanilla ice cream on top. We love pluots in our house. Poaching sounds like an amazing way to prepare them. 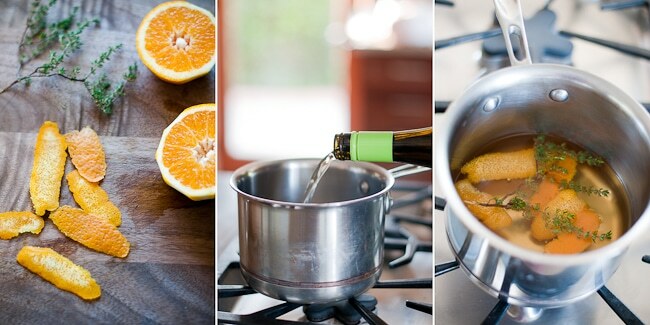 The addition of orange zest to the poaching liquid must add lots of great flavor. These look amazing! I have to force myself to actually cook with the stone fruits I get from my CSA — it’s too tempting to just eat them at the kitchen sink! Haven’t gotten any plums yet, maybe I’ll get some from the farmer’s market this weekend so I can poach them in Riesling. As ever, you achieve elegant simplicity (simple elegance?). And I have never tasted a pluot! Silly me. You pluots are incredibly beautiful! Pluots are genius! I had one for the first time a year ago, and I was blown away. I didn’t expect to like them, because I don’t like apricots (texture issue) but pluots are a completely different matter. And hey, you could poach a turd in Reisling and it would probably taste all right…I’m sure a poached pluot is downright “luscious.” Gorgeous to look at, too. What a great combination and caramel sauce… wow! That. Sounds (and looks). Fantastic! 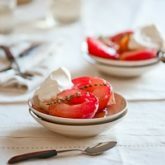 Love the poached fruit recipe. Whimsical and ever so beautiful! 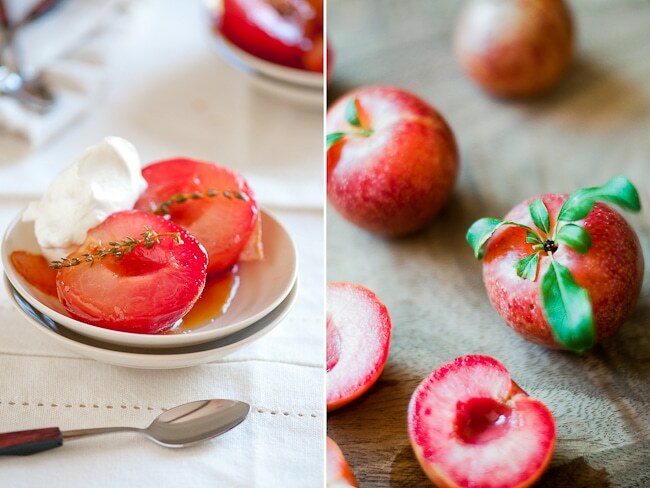 I have done so much with stone fruit this season, and I love these pluots! I will admit that I have never cooked with pluots because we usually eat them up before they can make it anywhere near the oven. Making the caramel sauce with some of the poaching liquid is brilliant! I just drooled!!! Oh my. I will be making this soon. Mmmm, I think the whole thing looks luscious! What a gorgeous summer dish…! 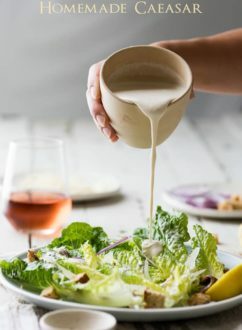 The colors are fabulous…and I’m sure this tastes pretty amazing too…love perfect summer produce – especially with some wine, caramel and cream! You had me at riesling. What I love is the many different varieties of pluots out there. And Apriums. And Plumcots. I used to just graze up and down all the fruit stands at the farmer’s markets during Summer. Ah, bliss!